A wonderfully sweet coconut macaroon cookie with all the layers of flavor you would expect from the real thing. Enjoy crispy toasted and soft creamy coconut layers of irresistible flavor. *If you enjoy an extra-sweet vape add a drop or two of our Sweetener Drops to your e-Liquid, shake and enjoy. Meh. I was excited to try this, but ends up being the last flavor with the most left. It tastes as it reads, but personally it's not for me. 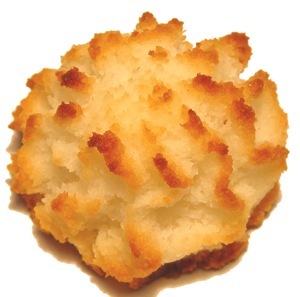 If you love coconut macaroons give it a try, if your like "I love deserts" go to sugar cookie or gooey butter cake! I did add sweetener drops to it, just one, and it made it magical. If you like sweet things this is isn't for you as it's just almost there... If you like mildly sweet, then def try! I love Coconut, but all the coconut flavors out there are more perfumery then a flavor for vaping. This Coconut Macaroon is so good, it's hard to describe. There is no perfume taste or after taste at all. I have not been able to find anything even close as good as this. If you enjoy coconut, you've got to try this! It has just enough "hit" to let you know the Macaroon is there. Oh SO GOOD!!! I had to lower my mgs due to the TH. Coconut gives it a boost! EWWW to Coconut turned to YUM!! Honestly...I DO NOT like most things coconut. I ordered this for my boyfriend. BUT...I always try out our new flavors because someone said to try flavors that you think you won't like...that you may be surprised. This one surprised me greatly! It is a wonderful cookie vape with a hint of toasted coconut. I filled my tank with this one. Not too sweet and super tasty! Thanks AltCig! I use this toasted coconut taste as my main flavor. Nice! I have spent too much money trying to find good flavors from dozens of companies. Altcig, you have a lifetime customer. All four of the flavors I got are delicious. I am addicted to coconut macaroon and the gooey cookie. I wish I had found you a year ago. Vaping at 4.5 to 5v with a genesis on a provari and ego twists. Got this one as a free sample. I'm not crazy about Coconut Macaroon cookies, so was thinking I wouldn't like it.Wow! was I surprised. This is so good. I'm having a hard time putting it down. I just ordered a bigger bottle, and can't wait to get it. This will be an ADV for me. love this flavor,great coconut blend!